On an uncertain date around this time — sort of — in 46 B.C.E., the Gallic chief Vercingetorix was marched as Julius Caesar’s star captive in Rome, then strangled in prison. A nobleman who in the course of things would have been destined for that class of domestic elites bought off by Rome for orderly management of conquered provinces, Vercingetorix instead mounted a massive and effective semi-guerrilla resistance. 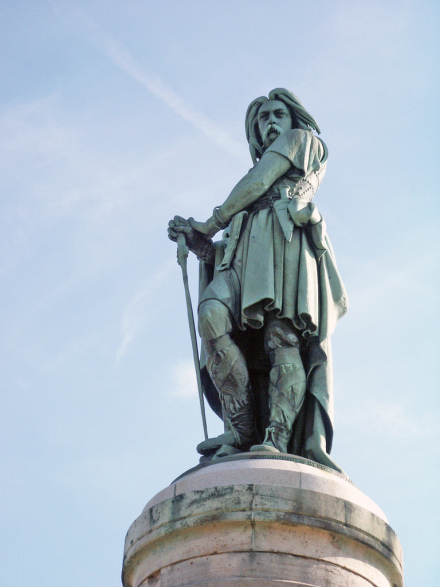 A few months after Caesar had declared “Mission Accomplished” and Gaul at peace, it rose in arms … and, as Vercingetorix rolled out a scorched-earth defense, in flames. Julius Caesar, then serving a long and lucrative career as Governor of Gaul, managed only with difficulty — and staggering bloodshed — to pacify the province at the Battle of Alesia. It was a signal military engagement in the development of the Roman Empire, cementing Roman power in Gaul for centuries to come. The wily barbarian’s revolt and the very serious danger it posed to Caesar’s ambitions are the subject of a five-part BBC documentary. Vercingetorix’s allegedly theatrical surrender to Caesar essentially ended the Gauls stubborn, centuries-long resistance to Roman dominion. Either way, the once-intractable province became the bastion from which Caesar would overthrow the foundering Roman Republic. Political rivals in the capital for whom Caesar’s Gallic campaign was nothing to celebrate denied Caesar a ceremonial Triumph and maneuvered to check the ambitious general. When the conflict came to a head in 49 B.C.E., Caesar’s bold move from the provincial borders of Gaul into Italy — crossing the Rubicon — ignited civil war in Rome. Vercingetorix languished in Roman chains all along, until Caesar finally mopped up his enemies in the field and returned to Rome, where he celebrated an extravagant quadruple Triumph for his various military achievements. when he returned to Rome he had four triumphs together: one for his Gallic wars, in which he had added many great nations to the Roman sway and subdued others that had revolted; one for the Pontic war against Pharnaces;* one for the war in Africa against the African allies of L. Scipio, in which the historian Juba (the son of King Juba), then an infant, was led a captive. Between the Gallic and the Pontic triumphs he introduced a kind of Egyptian triumph, in which he led some captives taken in the naval engagement on the Nile. ** Although he took care not to inscribe any Roman names in his triumph (as it would have been unseemly in his eyes and base and inauspicious in those of the Roman people to triumph over fellow-citizens), yet all these misfortunes were represented in the processions and the men also by various images and pictures, all except Pompey, whom alone he did not venture to exhibit, since he was still greatly regretted by all. The people, although restrained by fear, groaned over their domestic ills, especially when they saw the picture of Lucius Scipio, the general-in-chief, wounded in the breast by his own hand, casting himself into the sea, and Petreius committing self-destruction at the banquet, and Cato torn apart by himself like a wild beast. They applauded the death of Achillas and Pothinus, and laughed at the flight of Pharnaces. It is said that money to the amount of 60,500 silver talents was borne in the procession and 2822 crowns of gold weighing 20,414 pounds, from which wealth Caesar made apportionments immediately after the triumph, paying the army all that he had promised and more. Each soldier received 5000 Attic drachmas, each centurion double, and each tribune of infantry and perfect of cavalry fourfold that sum. To each plebeian citizen also was given an Attic mina. He gave also various spectacles with horses and music, a combat of foot-soldiers, 1000 on each side, and a cavalry fight of 200 on each side. There was also another combat of horse and foot together. There was a combat of elephants, twenty against twenty, and a naval engagement of 4000 oarsmen, where 1000 fighting men contended on each side. He erected the temple to Venus, his ancestress, as he had vowed to do when he was about to begin the Battle of Pharsalus, and he laid out ground around the temple which he intended to be a forum for the Roman people, not for buying and selling, but a meeting-place for the transaction of public business, like the public squares of the Persians, where the people assemble to seek justice or to learn the laws. He placed a beautiful image of Cleopatra by the side of the goddess, which stands there to this day. He caused an enumeration of the people to be made, and it is said that it was found to be only one half of the number existing before this war. At the Gallic triumph, Vercingetorix — by far the most fearsome enemy Caesar had to display vis-a-vis a five-year-old child and the sister of his lover — was at last the center of attention again for a day. Still defiant, he was marched through the Eternal City, then strangled at the Tullianum, or Mamertine Prison. But which day? The bare fact is that we just don’t know, but this one has more than the typical imprecision that characterizes dating ancient events. This footnote on a page about Egyptian royalty grapples with the timing. four times in one month, each Triumph succeeding the former by an interval of a few days. Since Cassius Dio claims that Caesar dedicated the Temple of Venus (datable to late September of 46) on the last day of the last Triumph, that presumably makes September the “one month” of the various celebrations. That’s about as close as it gets, but even “September” comes with a caveat. During his few months in Rome between campaigns, Caesar accomplished a frenetic civil agenda (it helps to be dictator). Perhaps none is of such recognizable consequence for posterity as reform of the wacky solar-lunar hybrid Roman calendar — and 46 B.C.E. was the very year he implemented it. Disdaining incrementalism, Caesar tackled the mess the Roman calendar had become at once, by stuffing the year 46 up to 445 days. As a result, 365 days after the execution of Vercingetorix was not September of 45, but July (or possibly June) — and those months are sometimes given for the dates of Caesar’s Triumphs on this basis. Since Caesar actually won his decisive battle in April of 46 B.C.E. and returned to Rome that July, the potential for confusion multiplies: if you’re not accounting for the exceptional calendar, July Triumphs appear initially plausible. It is here that one beholds the essential subjectivity behind a putatively mechanistic device like a calendar: if Vercingetorix was executed in spring or summer, was he executed in September? Whenever it was that he was throttled in the Mamertine, Vercingetorix did not go quietly. If his cause of resistance to Roman authority was doomed for the time being, the eternal allure of rebellion — and, as the Gallic lands later germinated France, the proto-nationalism of his cause — secured him his own symbolic immortality. * The speedily resolved Pontic War gave us Caesar’s “veni, vidi, vici”. ** It was at the Egyptian triumph that Cleopatra’s sister Arsinoe was marched, though she was not executed afterwards.